Number of cattle and calves: Census of Agriculture — N.L. Number of pigs: Census of Agriculture — N.L. Number of hens and chickens: Census of Agriculture — N.L. Number of cattle and calves: Census of Agriculture — P.E.I. Number of pigs: Census of Agriculture — P.E.I. Number of hens and chickens: Census of Agriculture — P.E.I. Number of cattle and calves: Census of Agriculture — N.S. Number of pigs: Census of Agriculture — N.S. Number of hens and chickens: Census of Agriculture — N.S. Number of cattle and calves: Census of Agriculture — N.B. Number of pigs: Census of Agriculture — N.B. Number of hens and chickens: Census of Agriculture — N.B. Number of cattle and calves: Census of Agriculture — Que. Number of pigs: Census of Agriculture — Que. Number of hens and chickens: Census of Agriculture — Que. Number of cattle and calves: Census of Agriculture — Ont. Number of pigs: Census of Agriculture — Ont. Number of hens and chickens: Census of Agriculture — Ont. Number of cattle and calves: Census of Agriculture — Man. Number of pigs: Census of Agriculture — Man. Number of hens and chickens: Census of Agriculture — Man. Number of cattle and calves: Census of Agriculture — Sask. Number of pigs: Census of Agriculture — Sask. Number of hens and chickens: Census of Agriculture — Sask. Number of cattle and calves: Census of Agriculture — Alta. Number of pigs: Census of Agriculture — Alta. Number of hens and chickens: Census of Agriculture — Alta. Number of cattle and calves: Census of Agriculture — B.C. Number of pigs: Census of Agriculture — B.C. Number of hens and chickens: Census of Agriculture — B.C. Beef cattle for breeding and feeding purposes decreased 2.4% from 2011 to 2016, with both the cow-calf and the feedlot sectors showing marginal changes in reported cattle. The number of dairy cattle decreased 3.8% from 2011, while milk production continued to increase. Pig inventories increased 11.1% from 2011 to 2016, recovering from unfavourable market conditions in the pig sector prior to 2011. Poultry production increased for both meat and eggs, in response to consumer demand. The analytical document Production efficiency and prices drive trends in livestock is now available. This article is taken from an analytical series based on 2016 Census of Agriculture data. 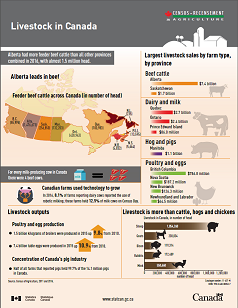 Based on the data from the 2016 Census of Agriculture, the infographic "Livestock in Canada" (Catalogue number11-627-M) gives a visual overview of the livestock sector in Canada. The national snapshot, 2016 Census of Agriculture as well as provincial highlights are now available online. The article, "Production efficiency and prices drive trends in livestock" which is part of Farm and Farm Operator Data (Catalogue number95-640-x), is now available. For a complete list of our products, visit 2016 Census of Agriculture. You can also consult the CANSIM tables 004-0200 to 004-0246.